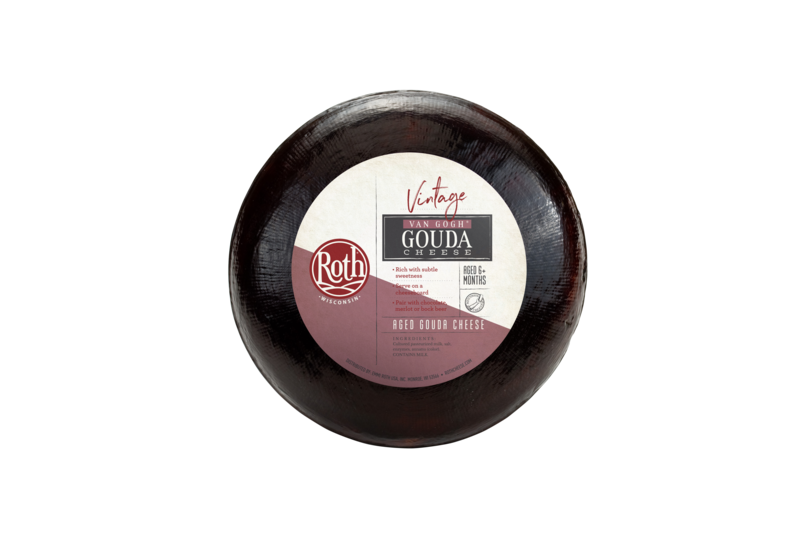 Inspired by traditional recipes, our Gouda is a version of the Dutch-style classic. 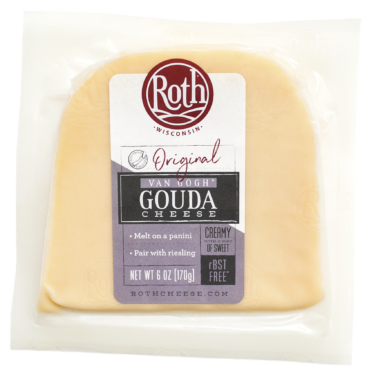 Ours is made here in Wisconsin, where green pastures, fresh air and rBST-free milk allow our cheesemakers to craft the tastiest Gouda outside of Europe. 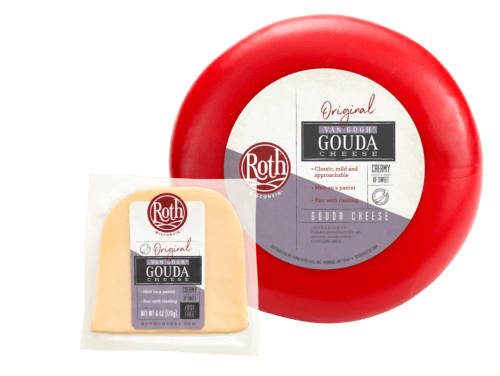 Perfect on your cheese platter. 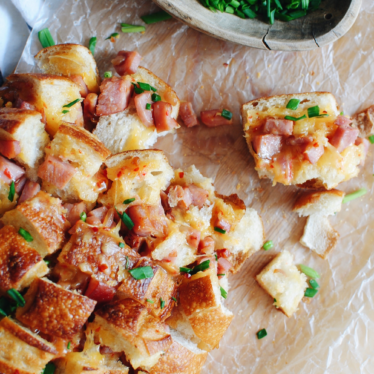 Ideal for a Tuesday night dinner. 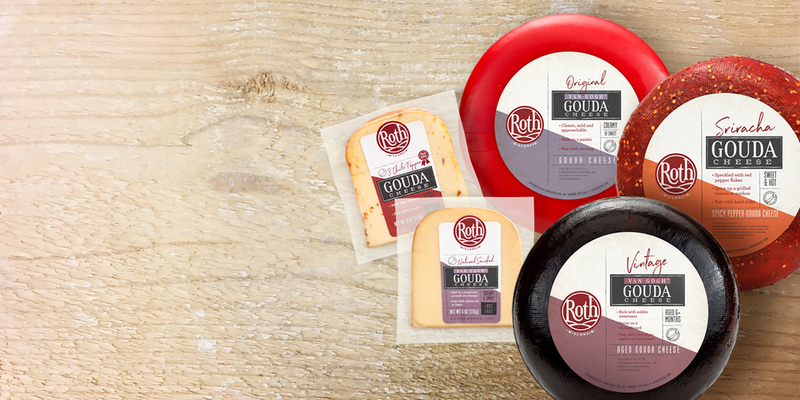 With five distinct varieties, it’s the most flavorful Gouda you’ll ever love. 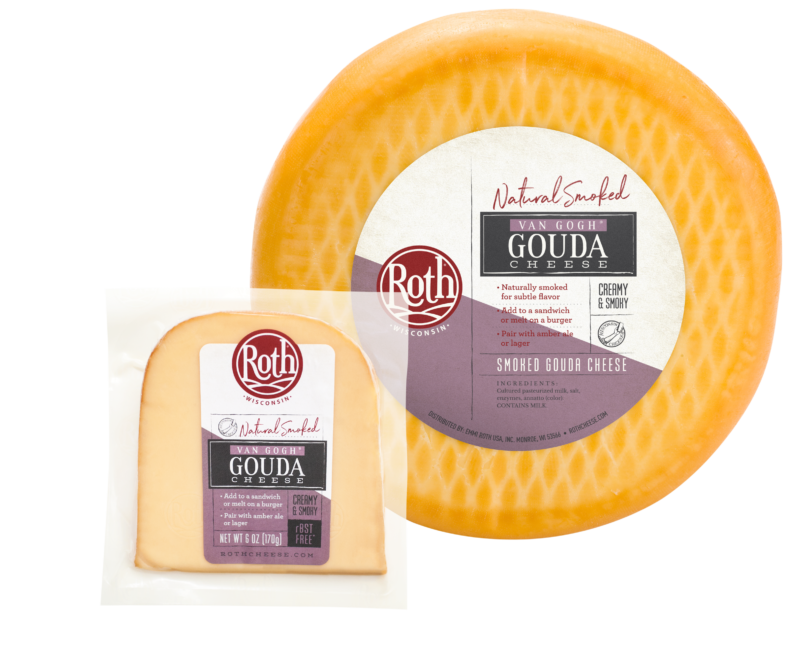 Crafted from fresh Wisconsin milk, Van Gogh® Original is the quintessential Dutch cheese. 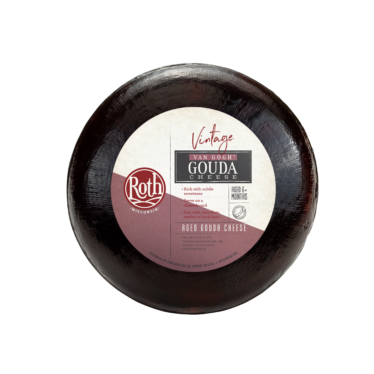 Its mellow and mild sweetness make it an ideal addition to everyday dinners and party-worthy cheese boards. Ingredients: Cultured pasteurized milk, salt, enzymes, annatto (color). Nutrition Facts: Serving Size 1 oz (28g), Servings Per Container: Varied, Calories 100, Total Fat 8g (11% DV), Sat. Fat 5g (25% DV), Trans Fat 0g, Cholest. 30mg (9% DV), Sodium 140mg (10% DV), Total Carb. 1g (1% DV), Fiber 0g (0% DV), Sugar 0g (Includes 0g Added Sugars, 0% DV), Protein 7g, Vitamin D 0.1mcg (0% DV), Calcium 212mg (15% DV), Iron .1mg (0% DV), Potassium 23mg (0% DV). * % DV = % Daily Value. CONTAINS MILK. KEEP REFRIGERATED. 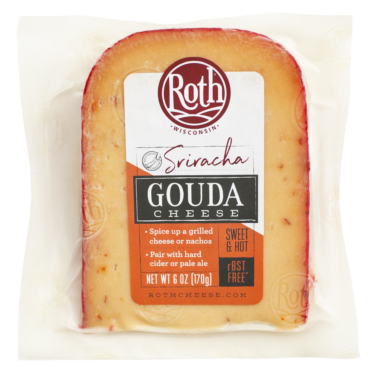 If you like your cheese hot, this one’s for you. 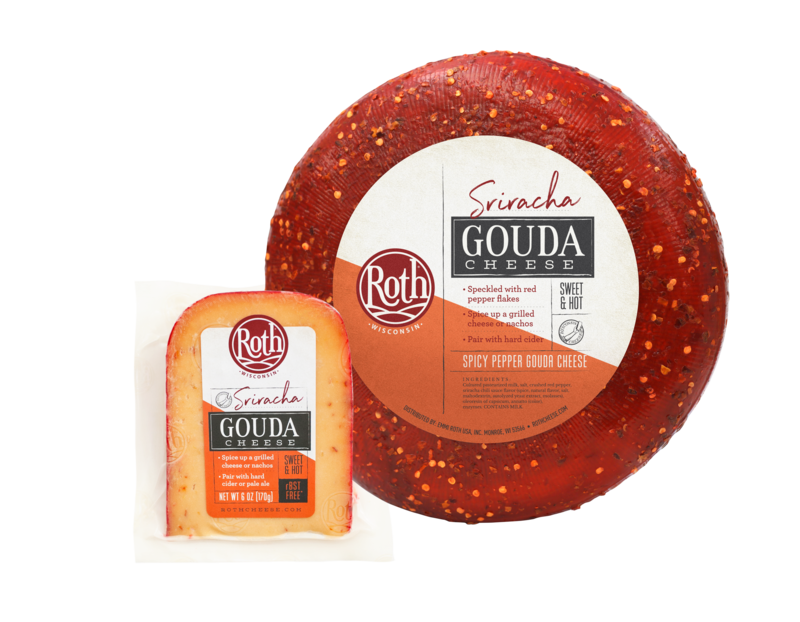 Our Sriracha Gouda gives you all the sweet creaminess of our classic Dutch-style Gouda with your favorite spicy kick. 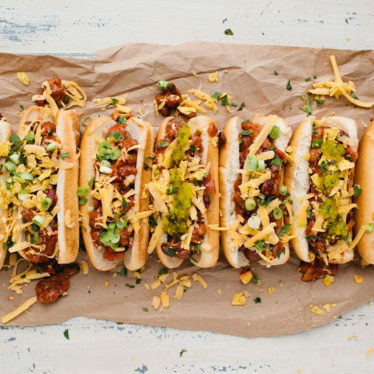 It’s made with Sriracha chili sauce and rubbed with crushed red peppers for a bright red rind you’ll never want to stop eating. Nutrition Facts: Serving Size 1 oz (28g), Servings Per Container: Varied, Calories 110, Total Fat 8g (11% DV), Sat. Fat 5g (27% DV), Trans Fat 0g, Cholest. 30mg (9% DV), Sodium 200mg (9% DV), Total Carb. 1g (1% DV), Fiber 0g (0% DV), Sugar 0g (Includes 0g Added Sugars, 0% DV), Protein 6g, Vitamin D 0.2mcg (0% DV), Calcium 210mg (15% DV), Iron 0mg (0% DV), Potassium 23mg (0% DV). * % DV = % Daily Value. CONTAINS MILK. KEEP REFRIGERATED. 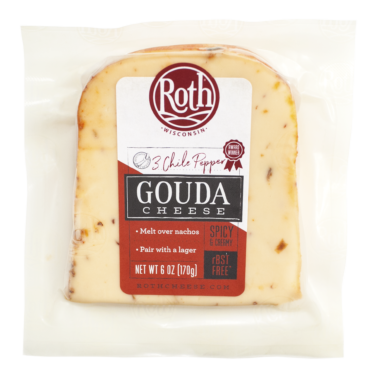 A colorful trio of chipotle, habanero and jalapeño peppers add a south-of-the-border twist to this award-winning cheese. 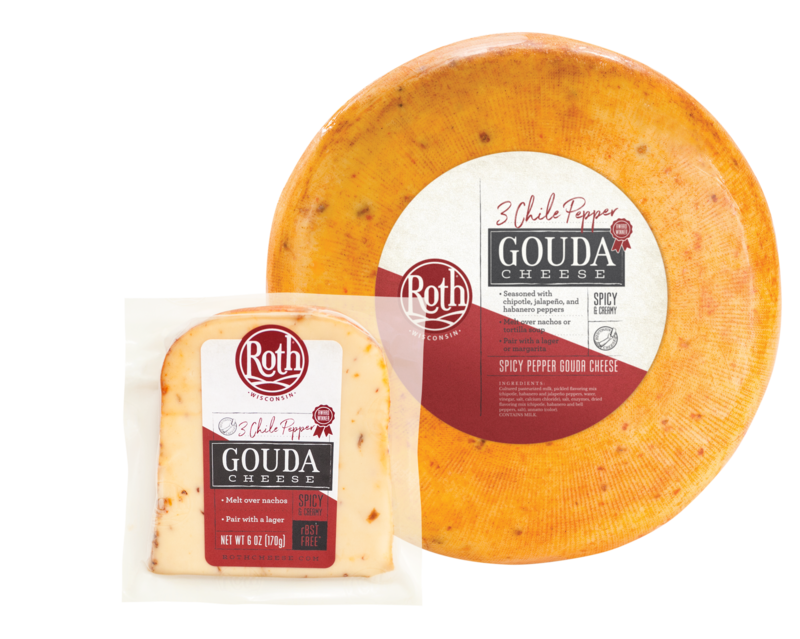 Our 3 Chile Pepper Gouda boasts more smoke than spice, which is balanced by a soft, buttery texture for depth. Nutrition Facts: Serving Size 1 oz (28g), Servings Per Container: Varied, Calories 100, Total Fat 7g (9% DV), Sat. Fat 5g (25% DV), Trans Fat 0g, Cholest. 25mg (8% DV), Sodium 160mg (7% DV), Total Carb. 1g (0% DV), Fiber 0g (0% DV), Sugar 0g (Includes 0g Added Sugars, 0% DV), Protein 6g, Vitamin D 0.2mcg (0% DV), Calcium 199mg (15% DV), Iron 0mg (0% DV), Potassium 20mg (0% DV). * % DV = % Daily Value. CONTAINS MILK. KEEP REFRIGERATED. 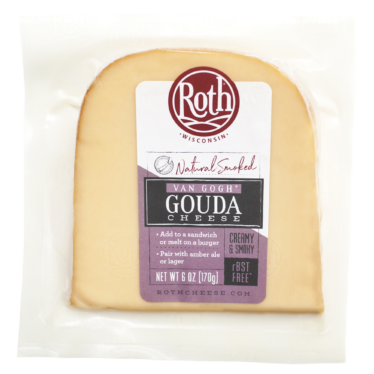 Our all-natural Gouda is delicately smoked, adding subtle flavor to this popular cheese. 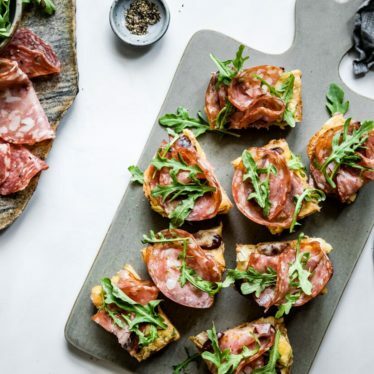 Artfully crafted, this creamy, smoky favorite is ideal for any occasion, whether you’re cooking for your family, entertaining friends or snacking on your own. Ingredients: Cultured pasturized milk, salt, enzymes, annatto (color). Nutrition Facts: Serving Size 1 oz (28g), Servings Per Container: Varied, Calories 100, Total Fat 8g (11% DV), Sat. Fat 5g (25% DV), Trans Fat 0g, Cholest. 30mg (9% DV), Sodium 140mg (10% DV), Total Carb. 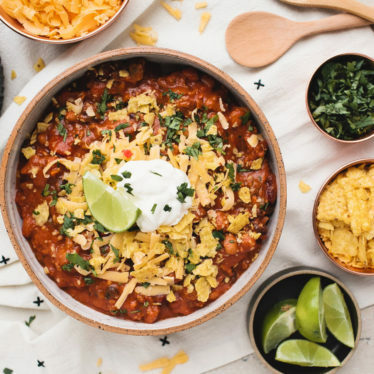 1g (0% DV), Fiber 0g (0% DV), Sugar 0g (Includes 0g Added Sugars, 0% DV), Protein 7g, Vitamin D 0.1mcg (0% DV), Calcium 212mg (15% DV), Iron 0mg (0% DV), Potassium 23mg (0% DV). * % DV = % Daily Value. CONTAINS MILK. KEEP REFRIGERATED. Nutrition Facts: Serving Size 1 oz (28g), Servings Per Container: Varied, Calories 100, Total Fat 8g (11% DV), Sat. Fat 5g (25% DV), Trans Fat 0g, Cholest. 30mg (9% DV), Sodium 140mg (10% DV), Total Carb. 1g (1% DV), Fiber 0g (0% DV), Sugar 0g (Includes 0g Added Sugars, 0% DV), Protein 7g, Vitamin D 0.1mcg (0% DV), Calcium 212mg (15% DV), Iron 0mg (0% DV), Potassium 23mg (0% DV). * % DV = % Daily Value. CONTAINS MILK. KEEP REFRIGERATED.